Dental cavities and gum diseases are caused due to certain types of Bacteria which are present in the oral cavity and with the use of antibiotics and medications over time these have evolved to obtain antibiotic resistance. Scientist Zisheng Tang and colleagues who have studied that bacteria are gaining Antibiotic resistance with the extensive use of antibiotics to treat many diseases including dental and systemic diseases, there has to be other ways to counter the bacteria and there is a compound called grapheme oxide which is a carbon nanosheets studded with oxygen groups which is said to act on the antibiotic resistant bacteria without harming human cells. 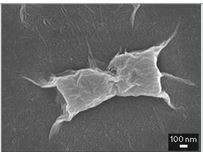 The Graphene Oxide compound is seen to act on bacteria by a process called as cell wrapping which wraps around the bacterial cell and deprives it of nutrition acting on the cell wall and decreasing the growth of the cell (as seen in the image). This was conducted on Antibiotic resistant E-Coli bacteria in 2012 by Researchers are A*STAR Singapore Institute of Manufacturing Technology. There are different materials like graphene oxide, graphite oxide and reduced graphene oxide which were tested on Escherichia coli and it was found that Graphene oxide has got the best result and also having the smallest size of all the materials makes it the best option to be used in humans. The researchers have tested Graphene oxide on various other species of bacteria which are likely to cause tooth decay and gum diseases and grapheme oxide acted on the cell walls and membranes of the bacteria and slowed their growth considerably. This has been taken into consideration and the potential use of nanosheets of graphene oxide is being suggested in improving dental care. The research is being conducted with the help of Shanghai Natural Science Foundation and the Hospital-Public Cross-Link Project of Shanghai Jiao Tong University. where can i buy this antibiotic medicine.